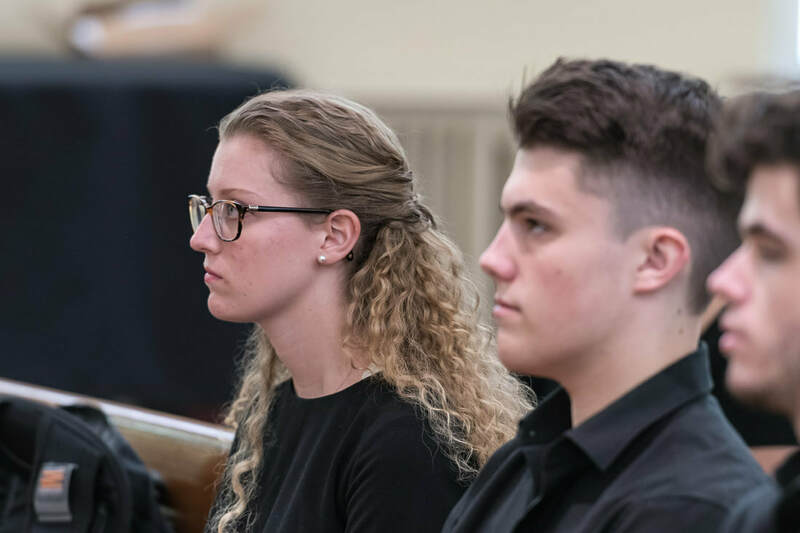 Recently, soprano Austin Nikirk presented her research from her Kolbe Fellowship alongside Dr. William O'Hara at the Music Theory Society of the Mid-Atlantic's Annual Conference held in Baltimore among some of the Mid-Atlantic's most important and recent studies in music theory! Austin said "It was incredible to get to hear the research of current graduate students and professors and really inspiring to watch them talk about projects they were so passionate about." Congratulations are in order for tenor Zach Taylor for not only being awarded first place in the Sydney Lieberman Music Competition, but also being announced as the co-winner of the Sylvia and Irving H. Cohen scholarship! On his recent successes, Zach said "I’m so incredibly grateful to everyone who has helped me come this far, as I couldn’t have gotten this far without the support of family, friends, and teachers." Catch Zach performing alongside other winners in the Lieberman Honors Recital on April 4 at 11am at Towson University. 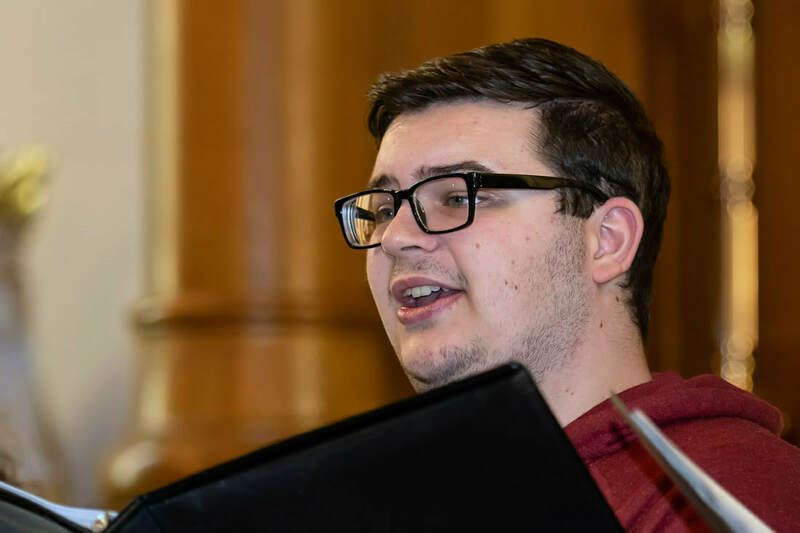 Director Robby Napoli has announced that he has been accepted into Seraphic Fire's Professional Choral Institute at the Aspen Music Festival and School! In 2012, Seraphic Fire and PCI received a Grammy nomination for their recording of Brahms' German Requiem. In the program, Robby will spend two weeks preparing to sing join the world of professional ensemble singing with members of Seraphic Fire as well as their artistic director, Patrick Dupré Quigley. About the program, he said "I was kind of speechless when I saw the message that I'd been accepted into the program. I'm just so excited to have this incredible opportunity to learn about something I'm so passionate about from some of the best in the country, and with such intensity. This is certainly going to be an experience I won't forget." It’s almost senior year! How’re you feeling about that? "Pretty excited! And also nervous. Lots of exciting things coming!" "I will be presenting some research I did last summer at a theory conference later this month with my mentor! Stay posted for more details on that later." "At school, we have a recital hour called “Now Hear This!” which is an hour on Fridays when students can sign up to perform things they’re working on, pieces for their recitals or juries, or just for fun. I’m usually in the last category, and I have performed on more than I can count, because I love the environment of getting up and practicing my art in front of my peers." "My recital is on March 1st at 3:30pm, in Schmucker Memorial Hall." What’s your favorite piece on your recital? Why? "It’s so hard to choose just one, I’ve lived with and researched this music for so long! But of course, French music is near and dear to my heart, so I would choose my Germaine Tailleferre set. This music was composed just following her divorce and miscarriage, and is widely considered as a reaction and way to process the immense grief and trauma she had just endured. So much of that emotion is obvious in the music, and portraying it on stage is definitely going to be a challenge." "All of the music I am singing is brand new for this semester, so I’ve really been learning and perfecting at the same time. It’s a lot of music to learn in such a short period of time, but I’m not sick of any of it yet, so that’s a good sign!" "My recital is all music by female composers, a largely and historically underrepresented group in the compositional world. I hope to bring exposure and excitement to their work, and encourage other musicians to seek out the music of less-performed composers and demographics." It's the end of senior year! How're you feeling about that? ​"Excited and nervous, which I imagine is how most people feel..."
"I'm really excited to be performing in Street Scene by Kurt Weill as part of UMD Weill Festival! I think it's an amazing show and I'm so excited to be a part of it." What's been your favorite experience studying music in college? "I've loved getting to make other musician friends. It's so special to be able to make music with people close to you, and the best part is that I know I will run into these people after I graduate because the music world is so small. I'm so excited to continue to make music with my friends as we all mature as musicians." Okay, so, recital time. Let's start with the easy question. When and where is your recital? "February 27 at 8pm in the Gildenhorn Recital Hall, which is in the Clarice Smith Performing Arts Center." What's your favorite piece on your recital? "I'm doing a set by Louis Beydts called Chansons pour les oiseaux. I think the music is so beautiful and harmonically interesting, and it's by a composer that not many people know. I love having the opportunity to introduce people to music that isn't widely known." "It usually involves me changing my repertoire about 17 times... There's just so much I want to sing! But once I settle on the repertoire, I translate and IPA the text, learn the notes, and listen to the music as much as possible. I find that listening to the music helps me memorize quickly and it’s definitely a painless way to memorize." If there's only one thing you want audience members to get out of your recital, what would it be? ​There’s so much wonderful music out there that isn’t widely performed! The set on my recital I’m most excited to share with the audience is my set of Indonesian art songs. Not only is it cool to share my culture with the audience, but it also shows them that there is a lot of cool music that comes from non-western countries. I would encourage everyone to explore music that is written by composers other than those we typically perform like Mozart, Schubert, etc. Tenor Anthony Jones Senior Recital is coming up in just a few days, on Wednesday, February 20th, at 5:30 pm CST! In his time with Lux, he's sung both tenor and baritone, and has been wonderfully versatile in these roles. His recital will be in the Recital Hall in the LSU School of Music, and will be streamed online via Facebook. See what Anthony had to say about the recital and more in our interview with him below! It’s both really exciting and incredibly nerve wracking! It’s crazy to think how quickly time has passed, and how far I’ve come as a singer and performer since I first started my degree. I’m nervous about what the world will have to say about me as a musician, but also super excited to show them what I’ve got! After finishing my recital where it’s just me, my pianist, and the audience, I get to immerse myself in two awesome collaborative/ensemble opportunities! This semester I will be playing the role of Presto in the Turner-Fischer Opera Center at LSU’s production of Les Mamelles de Tirésias by Poulenc, and I will be a part of the LSU School of Music’s performance of Brahms’ Ein Deutsches Requiem, one of the greatest masterworks in the Western canon. These two works are super different musically and thematically, so I’m excited to dive right into both! One of my greatest pleasures has been realizing the two sides of good musicianship. While many people think that music is only the “touchy feely” aspects of sentimentality, pageantry, and drama, I’ve also gotten to explore the more absolute sides of music, such as music theory, history, pedagogy and, of course, vocal technique. The marriage of preciseness and artistic license have really fascinated me, and I’m glad that I’m in a field that has the best of both worlds. It’s Wednesday, February 20th, at 5:30 pm CST, in the Recital Hall in the LSU School of Music! I intend on streaming it via Facebook, so all my friends and family back home can see too! I’m doing several great pieces, but I’d have to pick Till I Wake, which will coincidentally be the last song of the recital. It comes from the song cycle Five Songs of Laurence Hope which I will be performing the entirety. One of the things that I love about this song cycle is that it finds its music from H.T. Burleigh, an African-American composer living in early 20th century America, and it’s text from Adela Florence Nicolson, a young woman who wrote under the pseudonym Laurence Hope, which adds some much needed diversity to a recital comprised primarily of white male composers/poets. Till I Wake is a kind of dreamy, languid appeal of someone on their death bed asking their loved one’s to droop over them “like yellow roses in the South” that they knew in their youth, so that when the singer passes and then moves on to the next plane, they may see the faces of their beloved. It’s really pretty and very moving, and I think it’s a fitting farewell. It’s been a MARATHON! My recital came upon me a lot more quickly than I realized it would, and I had to learn a lot of completely new music, since I recently transitioned from tenor to baritone. All the practicing time has really allowed me to hone my technique, and I am super excited to share the fruit of my labors! My recital has a LOT of themes surrounding love in it’s different facets; there’s some new young love, love that you have held closely to for years, love that was ripped away prematurely, and even love that transcends the grave. I want people to be able to appreciate love in all its forms, and I wanna convey my love for all of this great music! 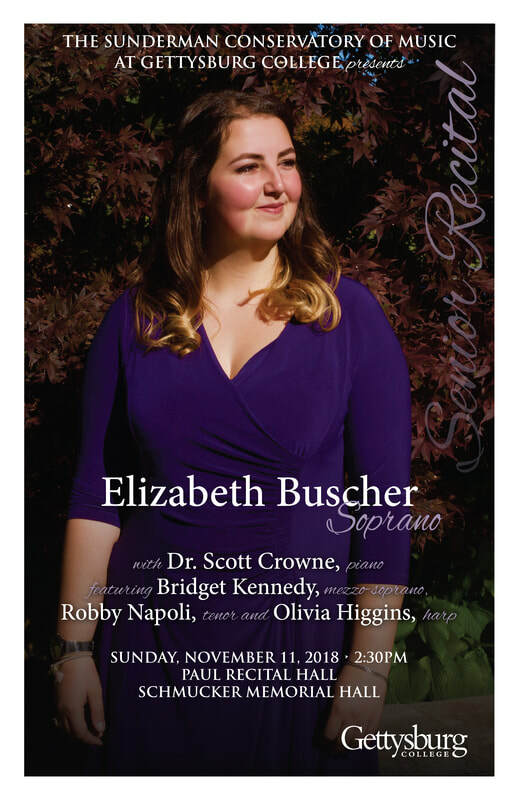 Just days away from soprano Eby Buscher's senior recital, she made some time to answer a few questions about her recital and about her final year! Joining her will also be director Robby Napoli, on two Schumann duets. If you can't make it, no worries, there'll be a livestream! For more information, check out the buttons below. It feels like it went by so quickly, but so much has happened and it’s crazy to look back on all I’ve done. But I’m also super excited about the future! Performing Handel’s Messiah with the Gettysburg College Choir. The opportunities to explore and perform many different types of music with many other talented people. Over four years, I have been able to perform in ensembles as different as Opera Workshop, Camerata, Gamelan, and the Bullets Marching Band, and sing everything from Baroque arias to vocal jazz to newly commissioned choral works. I have also been extremely fortunate to focus on what I love to perform by going to Italy for two vocal summer programs to study Italian language, music, and culture at Orvieto Musica and Si Parla, Si Canta. November 11, 2018 at 2:30pm in Paul Recital Hall in Schmucker Memorial Hall at Gettysburg College. “Pur Ti Miro” from L’Incoronazione di Poppea by Claudio Monteverdi. It combines my three loves: Baroque music, opera, and “la bella lingua,” the Italian language. Featuring Bridget Kennedy, mezzo-soprano, it is a duet full of crunchy suspensions and stunning lyrical lines. “Piangero, La Sorte Mia” from Giulio Cesare is a close second though, due in part to it being composed by G.F. Handel, my favorite composer. It is also stunningly beautiful and depicts raw emotion of grief and anger through both simple and challenging phrases. How has the recital process been for you? What did you do to prepare, and how do you feel about it all? The process has been actually really fun for me. I’ve done a lot of research into the background of the compositions and composers, the characters, listened to many recordings, as well as developed storylines of my own for the art-songs. It takes a lot of time in and out of the practice room but I’ve loved it and I’m super excited. Opera and Early music are not as boring as some people make it out to be. They are super challenging, extremely expressive, and can connect to the modern world in a number of ways.